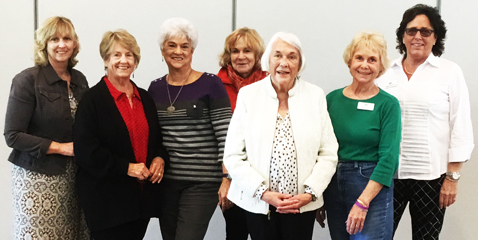 Kathryn Keitzer, Laura Crenshaw, Prudy Stephens, Mary Thom, Peg Moore, Cindi Sanders, and Caroline Haines. Not in photo: Linda Sorrels. New photo of Board Members is coming soon. Our Consitution directs that the business of the Association shall be managed by the Board of Directors, consisting of the six Officers and three Directors. Each Board Member shall serve for a term of one year. Our Association is established for non-profit purposes. The corporation is exempt from Federal Income Tax under Section 501 (c) (3) of the Internal Revenue Code of 1954. In addition to the Board of Directors, the Senior Association has two paid staff coordinators who maintain the year-to-year business continuity and assist the Directors in the Association's day-to-day operations.